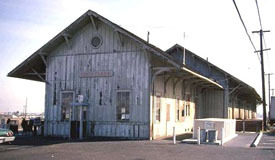 Renovating and preserving the Santa Clara depot was the first major endeavor of the SBHRS. Below are a few pictures showing the before and after results of this effort. The building structure is approximately 50′x225′ and has four significant sections. The former passenger area which includes the passenger waiting area, the stationmasters office, restrooms, and the former baggage storage room (now the SBHRS library with railroad books, videos, movies, and historic railroad papers). The original freight house. This room is now used for a meeting room and museum artifact display area. The freight house extension. Now used for the scale model railroad and artifact displays. 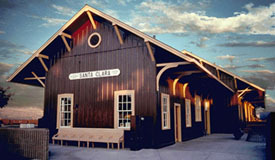 In 1985, the depot was placed on the National Register of Historic Places. A brief history of the depot is available.